Many times when a Sedona or nearby Cottonwood patient comes to us wanting to replace a missing teeth, it is due to embrarrasment or wanting to improve their overall smile. When you have lost a tooth, you may feel unattractive and embarrassed to smile. Just one missing tooth can make it difficult to chew and can interfere with your normal bite. Replacing missing teeth with dental implants can improve your appearance and mouth function so that you can smile, bite and chew more easily. It is permanent. It is not a denture that can be taken out when required. Dental Implants are designed to look, feel and function like your natural teeth. Dental Implants can help correct your bite and keep other teeth from shifting out of place. You do not have to take it out before a meal. It can be made to look like the rest of your teeth. Dental Implants help prevent changes in your facial structure. Care is taken to match the color and the shade so that there isn’t the slightest hint of it being a false tooth. Dental implants help preserve your jaw bone. When a tooth or multiple teeth are missing, the underlying bone deteriorates, which leads to oral health problems. The dental implant is stand-alone and does not need to depend on the adjoining teeth for support! Dental Implants are better than traditional bridges because they don’t require grinding down healthy adjacent teeth to anchor a bridge. They are extremely comfortable and no one will ever know that you had a tooth replaced. You can step out in style, and live life MORE FULLY, completely satisfied that this was a decision well taken. The first step in obtaining a dental implant is a good plan –FIND OUT THE FIVE THINGS YOU MUST KNOW BEFORE GETTING A DENTAL IMPLANT. Dental implants are the closest thing you can get to natural, healthy teeth. Think of a dental implants as artificial tooth roots. When dental implants are placed they integrate to your jawbone becoming a strong base for one or more artificial teeth called crowns. Because dental implants become part of the jaw, they feel like natural teeth. A single dental implant is comprised of three parts. Over the last decade plus, Roy Daniels has become a highly rated Sedona and Cottonwood area dentist who has placed implants for scores of patients from the Verde Valley area. During this time we believe it is important to make sure our patients are fully educated about all aspects of the dental implant placement and restoration. This dedication ensures that patient outcomes are more positive and the patient is comfortable with their dental implant choices and the dental implant costs If you are having a dental implant placed, Dr. Daniels believe you should know about what is being placed in your body. You need to be healthy and not be suffering from any ailments in order to qualify for a Implant. The dentist will need to check the condition of your gums and make sure that you do not suffer from bleeding gums. When attempting to explain the costs of dental implants it is necessary to understand that the patient is buying a service and not a product; it is very easy to forget when price shopping. No two people or their customized dental implant treatment are exactly alike – and neither are the costs. But you might be surprised to find out how affordable dental implants are compared to other tooth replacement options. 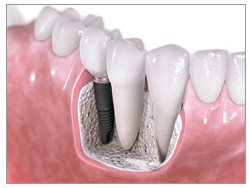 Every dental implant procedure is customized to fit the unique needs of the patient. Your dental implant has the potential to last a lifetime… if it is positioned and restored correctly. Unfortunately, when considering the cost of a dental implant, the patient may not consider that poorly positioned dental implants can become a nightmare for many years to come. The surgical placement of a dental implant as little as two millimeters can mean the difference between success and failure. The removal a poorly placed implant is difficult, destroys the surrounding bone and can cost more that the original placement. Do they use and charge for digital three dimensional imaging for designing the treatment plan of you dental implants? Does your dentist use a three dimensional implant guide to precisely place your dental implant? What is the cost of the restoration of the dental implant? Is the abutment a custom abutment or a generic one? What type of crown is being placed on your dental implant? Will there be any temporary replacement tooth during the implant procedure and what are the costs of that? Dental Insurance policies vary; very rarely will insurance cover the entire dental implant procedure as a whole., but insurance may cover a portion of each stage of the procedure. Often dental x-rays or three dimension dental imaging is required prior to the placement of a dental implant. This costs are sometimes reimbursed at 100%. Tooth extractions are often needed before the placement of dental implants, which many dental insurance companies consider a basic procedure. as a result, 60 to 80% of the cost of the dental extraction will be covered by dental insurance. Often bone grafting either at the time of the tooth extraction, our during the implant placement is needed to increase the density of the bone. It depends on the insurance company policy, some dental insurance will not cover the cost of bone grafting, and in some cases some companies pay up to 80%. There are a few companies that will pay for the crown on top of the dental implant. Our office will help you file a claim in an attempt to get some sort of reimbursement for your dental implant procedure such as x-rays necessary, diagnostic models, tooth extraction, bone grafting and other necessary parts of placing a dental implant. Your dental implant needs to be part of your normal oral hygiene. Ensure that you brush and floss twice a day so that there is no scope for infection or for bacteria to accumulate. Dr. Daniels will develop the best care plan for you. Follow it thoroughly. Do not miss the appointments that have been scheduled. This way your dentist will be in a position to make sure that both your teeth and gums remain strong and in good shape. To learn more about dental implants and discuss your options, please schedule an implant consultation with Dr. Daniels by contacting our office today 928-282-3246. Dr. Roy Daniels a highly rated dentist in Sedona and nearby Cottonwood, AZ helps Sedona dentistry patients throughout Sedona, Cottonwood, Cornville, Flagstaff, Clarkdale and Munds Park achieve bright Sedona smiles with dental implants.